There have been many mad engine transplants done in the past. 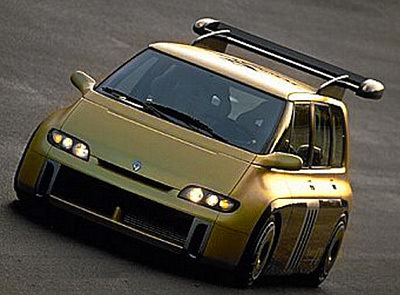 However the Formula One V10 powered Renault Espace MPV from 1995 has got to be one of the best. The Espace F1 was created to mark the 10th anniversary of Renault's involvement in the Formula One series. 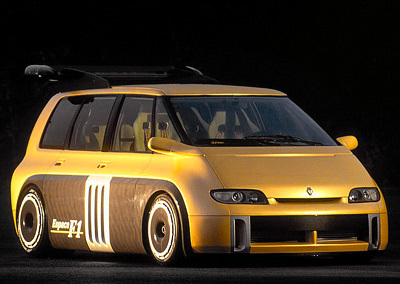 Despite its boxy appearance the Espace F1 was in fact more closely related to F1 cars than minivans. Underneath the custom made carbon fiber bodywork was a modified Williams F1 car chassis. Housed in the center of the vehicle was a Renault RS5 40-valve V10 engine which was upgraded to produce 800 hp - 100 hp more than the race car produced! Power was sent to the rear wheels through a 6-speed semiautomatic gearbox. Top speed of the Espace F1 - if you were brave enough - was 194 mph. The 0-60 mph sprint was dealt with in a mind blowing 2.8 seconds. 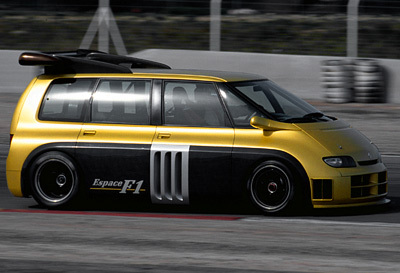 In fact the Espace F1 could reach 125 mph in less time than it took a Mazda MX5 (Miata) of the same year to hit 60 mph. The body of the Renault Espace F1 was actually surprisingly similar to the standard Espace - relatively speaking of course! The biggest changes included larger air intakes up front, wider wheel arches and of course that massive roof mounted spoiler. 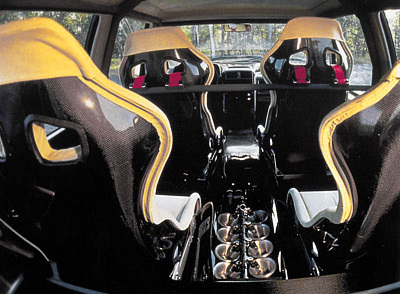 Inside the Espace F1 kept its ability to haul passengers - to a certain degree anyway. There were four individual bucket racing seats with full race harnesses. The rear seat passengers had to remember that those air intake trumpets weren't actually cup holders.